Our oldest cemetery, United German and French has retained its charm while still offering families burial within our newest garden area. 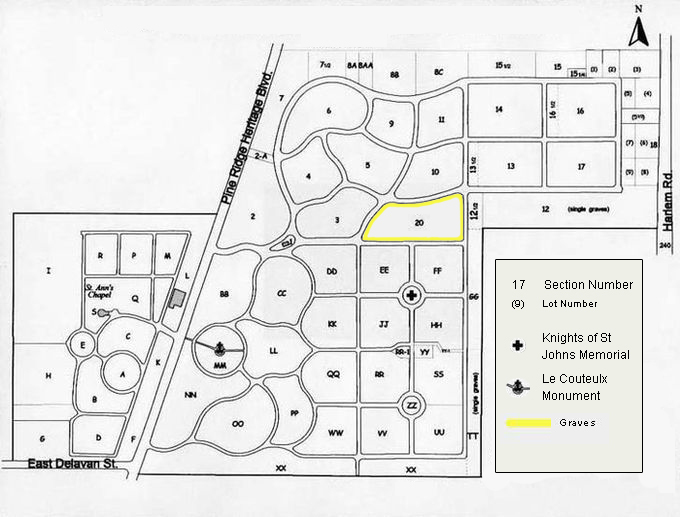 Section 20 is centrally located and features four garden areas: St. Matthew, St. Joseph, St. Gerard and St. James that have both upright monument and flat marker lots. Prices are $900 for a flat marker grave and $2100 for a two-grave monument privilege lot. Saint Louis Crucifixion- For those cremation orientated families seeking a balance of a religious and a tranquil setting conducive to visiting the Saint Louis Crucifixion feature is a logical choice. This sidewalk niche feature located within the United German & French Cemetery provides a place of reverence. Cremation Niches within this feature are available at $1000 each. It began in 1872 as a death house or vault for holding coffins until arrangements could be made for burial in the spring. With the frigid winters, the ground too cold to dig, with cholera, flu and other epidemics in the 1800's, burials couldn't be performed fast enough. The building was erected with locally quarried stone, a slate roof and cupola with a plain cross rising from its peak. Hitching posts were installed outside the fence. A bell was purchased in January 1873 for $25, including the framing. In 1889, the building was refurbished, with stained glass windows installed and a canvas ceiling mural signed by artist Frohe. Kneeling benches, statues and a Holy Water vessel completed the chapel's look. It was at this time that it was first referred to as a chapel, with the holding area six to eight feet below ground level and the chapel above. In 1976 the vault (lower level) was filled in and the entire structure was converted into the chapel as it remains today. 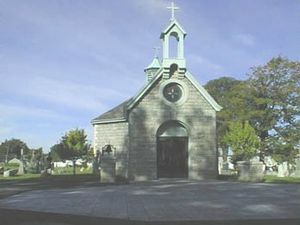 It was officially names St. Ann's in honor of St. Ann's Church, one of the original six Roman Catholic churches that formed the United German & French Cemetery Association. While no longer in use, the building remains a reminder of our rich history.